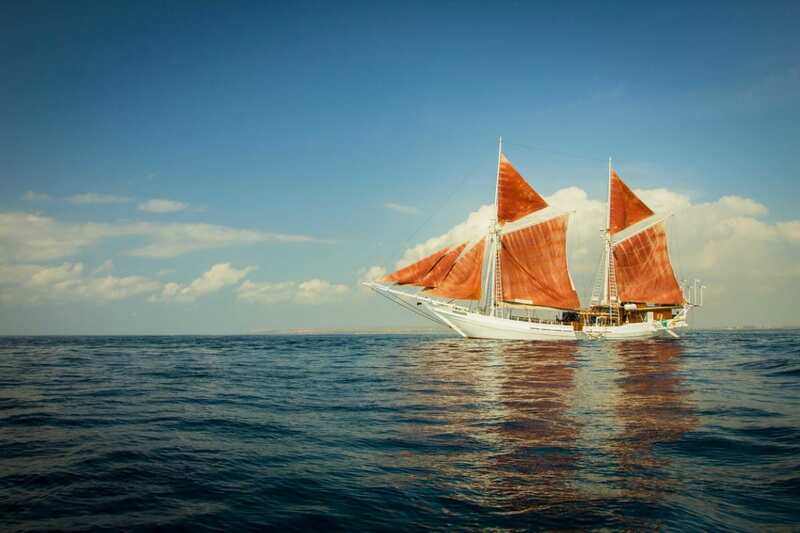 Tanaka is a first-class, five-cabin Phinisi yacht handcarved by master shipbuilders in Java. 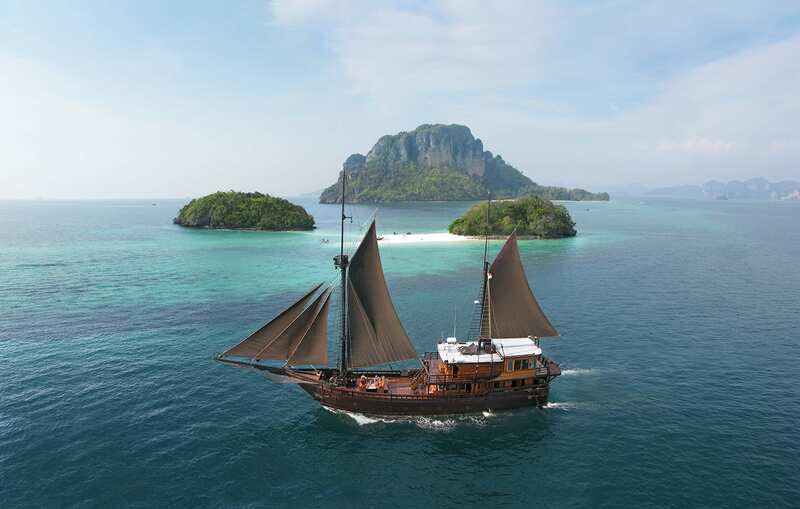 Fashioned from ironwood and teakwood, she pays homage to her Indonesian heritage while also placing herself firmly in the present with modern conveniences like luxurious air-conditioned cabins, a fully equipped kitchen, and state-of-the-art diving equipment. 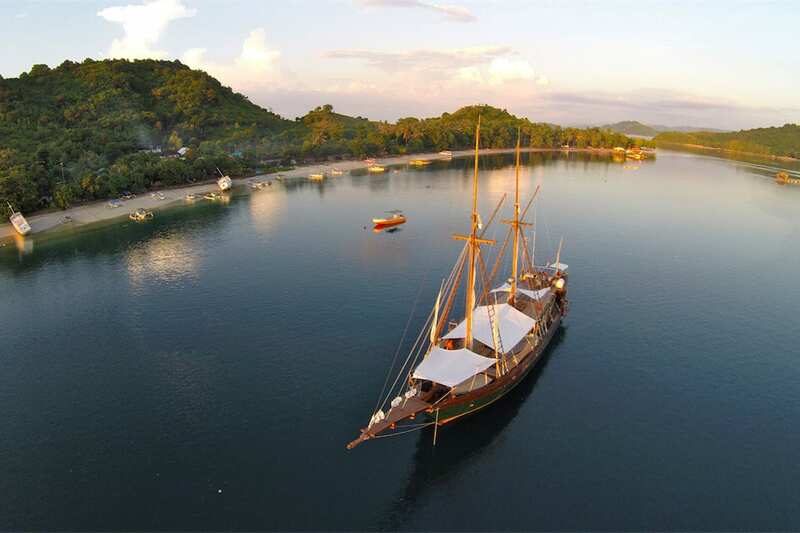 Perfect for couples, families, and groups of friends alike, Tanaka offers an elegant base for unforgettable island-hopping journeys through Indonesian waters. 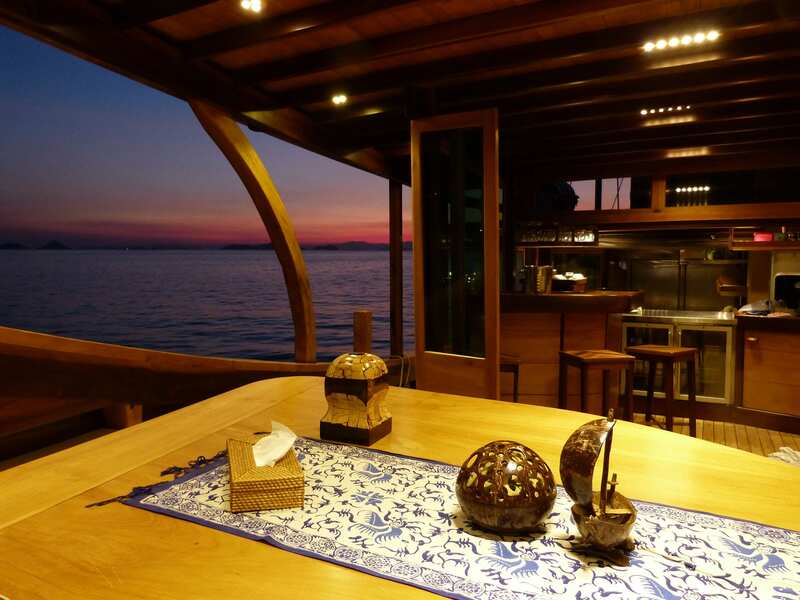 It took four years to build Tanaka, and the attention to detail shows throughout the ship from the carefully thought out living areas offering amazing views to the supremely comfortable cabins, and extras like laundry facilities. Warm wood tones and hues of of soft creams and blues adds a calm ambiance, and there are plenty of cosy corners to escape to as well as inviting spaces for social gatherings. 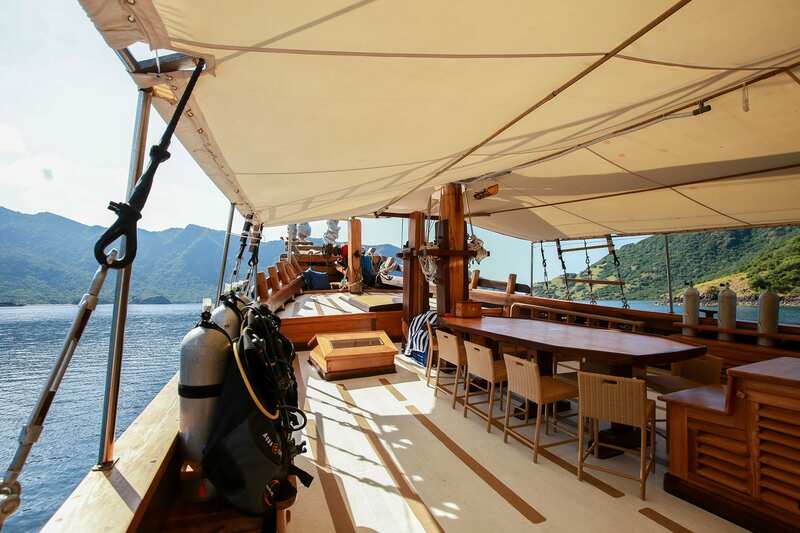 The foredeck is where sun lovers can soak up the rays and views while reclining on beanbags and benches. 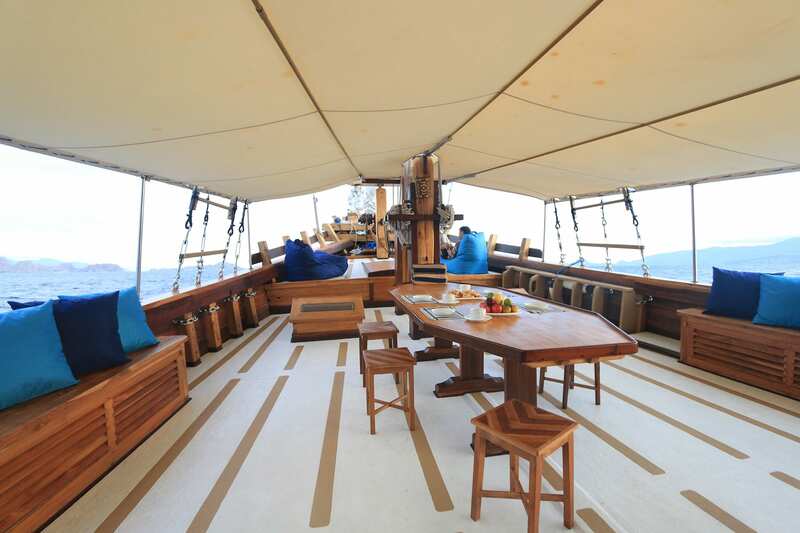 This area also has a long wooden table that can be shaded by a bimini or left open to the skies. Head inside and there is an air-conditioned saloon with a library, and a small bar where the staff can whip up fresh juices and cocktails. 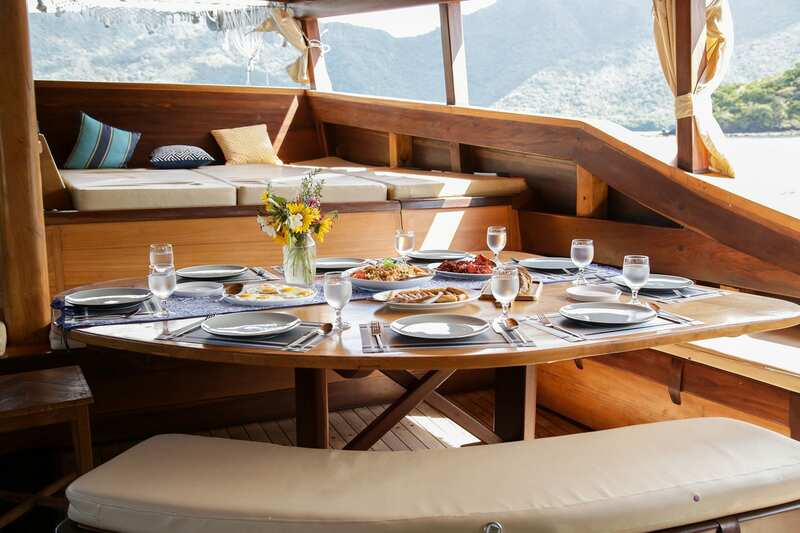 Follow through to the aft deck and you will find another covered dining area backed by a platform of raised daybeds. 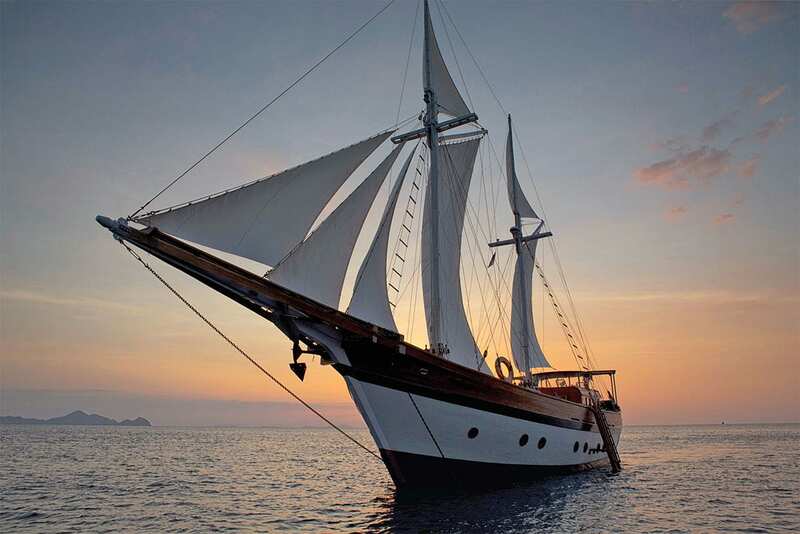 Tanaka offers private and shared charter trips with the option to tailor your journey completely to your tastes. 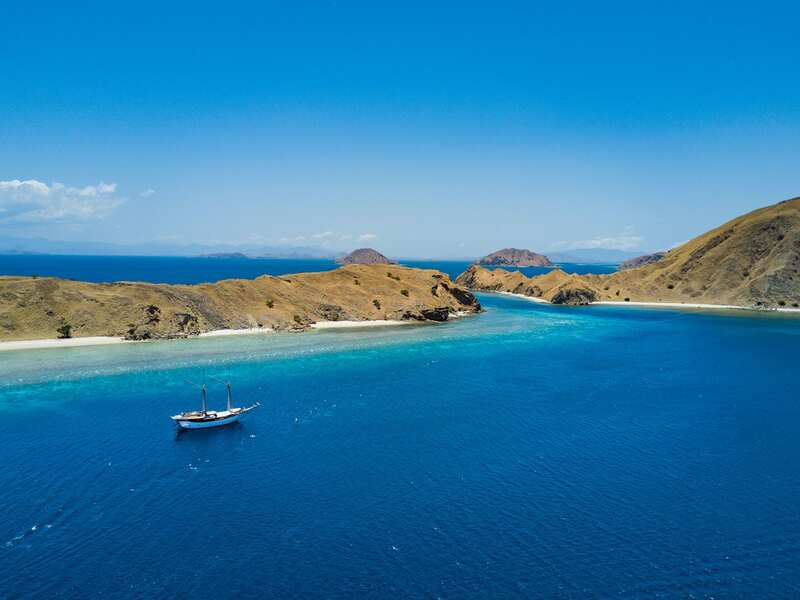 Destinations could include the rugged Komodo Islands, unspoiled Raja Ampat for incredible diving and snorkelling, the famed Spice Islands in the Banda Sea, and Flores for stunning natural beauty and cultural adventures. 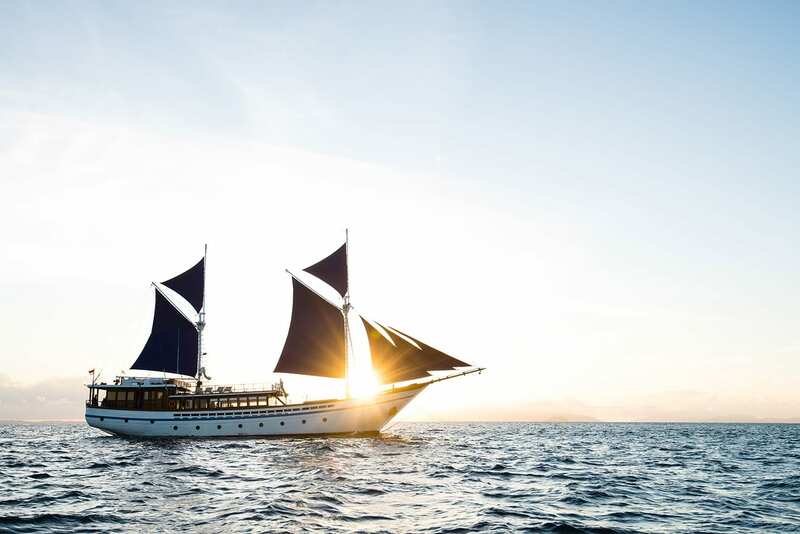 Simply contact us with your preferred destination and the dates you want to travel, and we can help you plan an unforgettable Indonesian cruise. 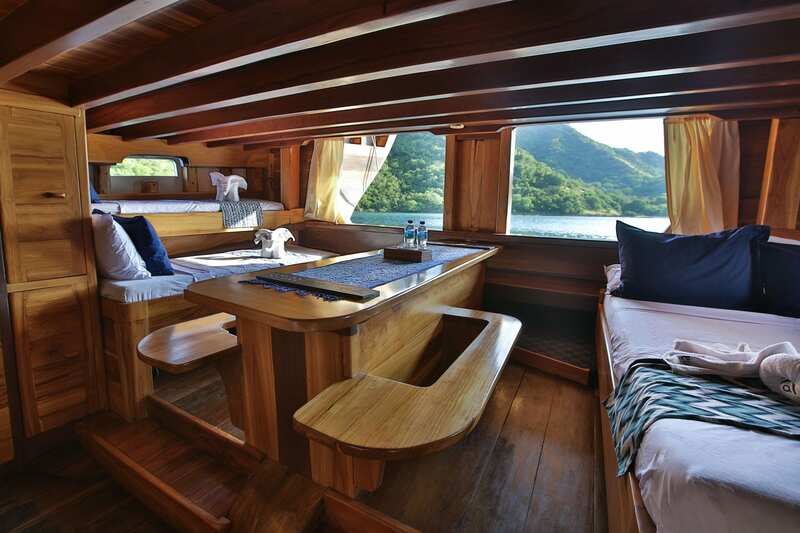 Tanaka was designed for all configurations of travellers with a variety of ensuite cabins that offer different sleeping arrangements. 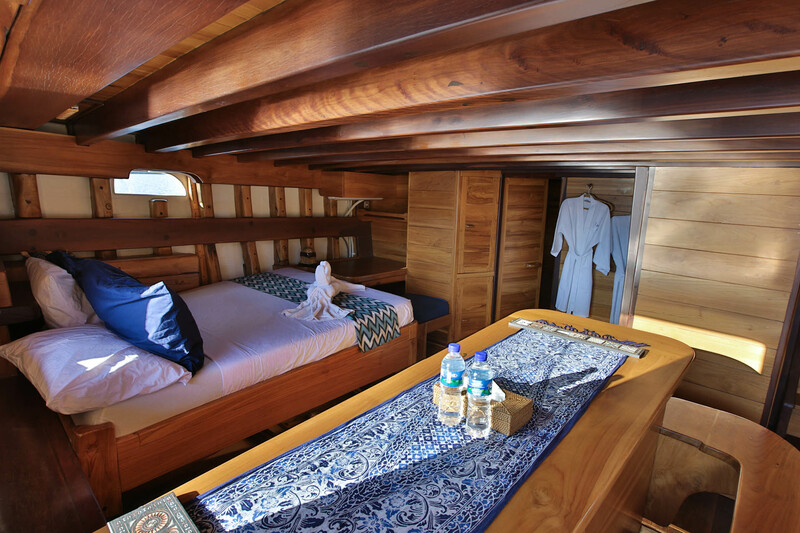 The spacious master suite is located in the stern and has a private balcony, plus a double bed and a bunk, making it perfect for families or couples and groups who want a bit more space. 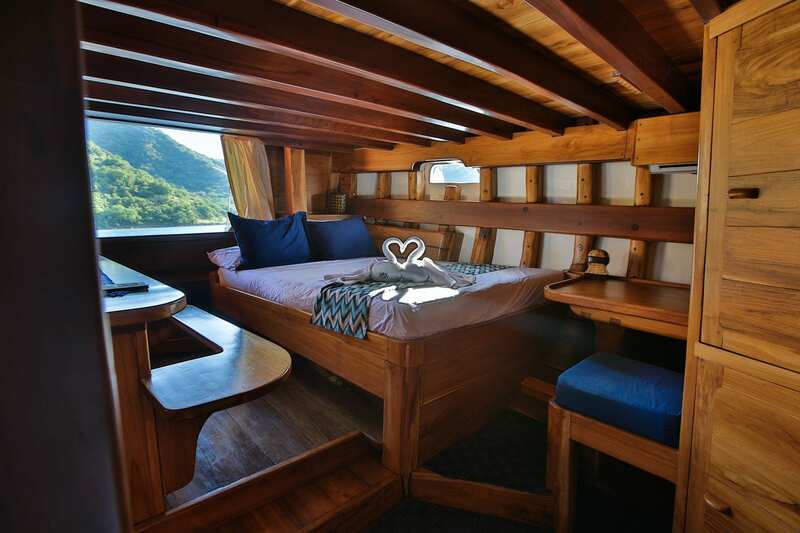 The remaining cabins include a triple cabin with three beds, another two triple cabins with double and single beds, and a double cabin with a double bed. 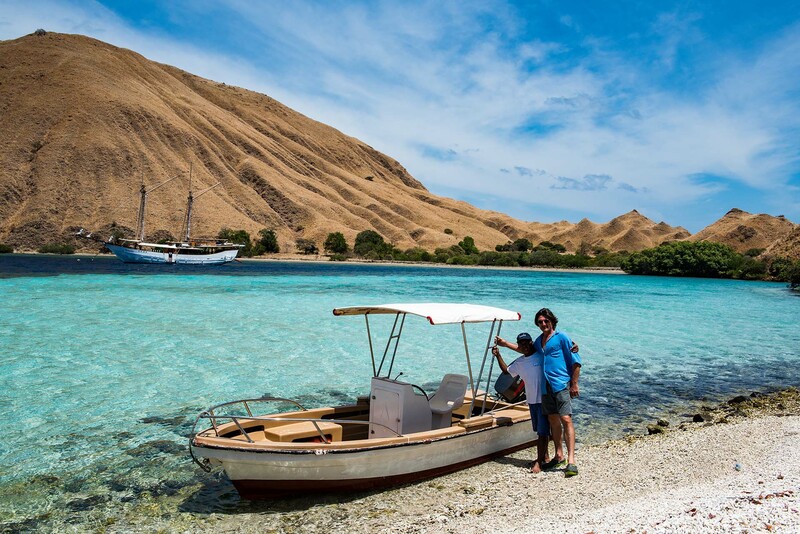 Tanaka’s talented crew include a cruise director who will guide you through the archipelago and can arrange special excursions, a dive instructor for underwater adventures, stewards to make sure the ship is spotless, and a chef trained in Indonesian and Western cuisine. 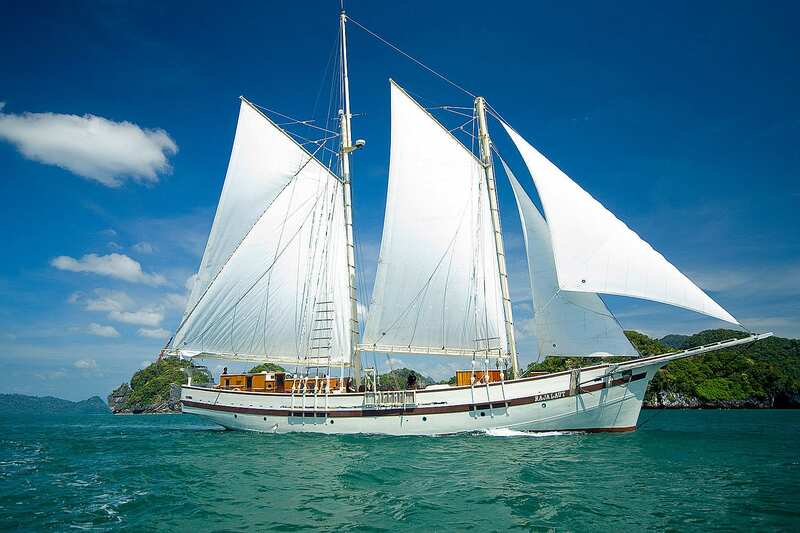 Guests can also make use of the ship’s water sports equipment including diving and snorkelling gear and kayaks. 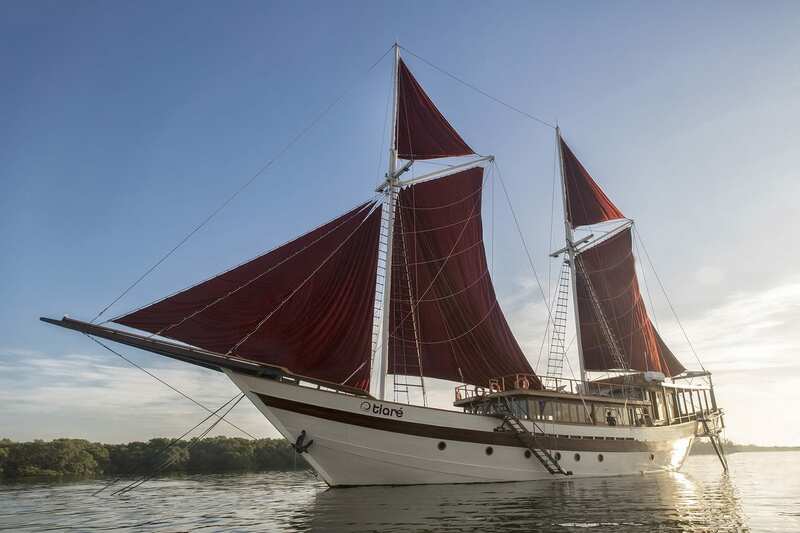 Tanaka was built in 2014 and spans 35m with a draft of 2.3m. 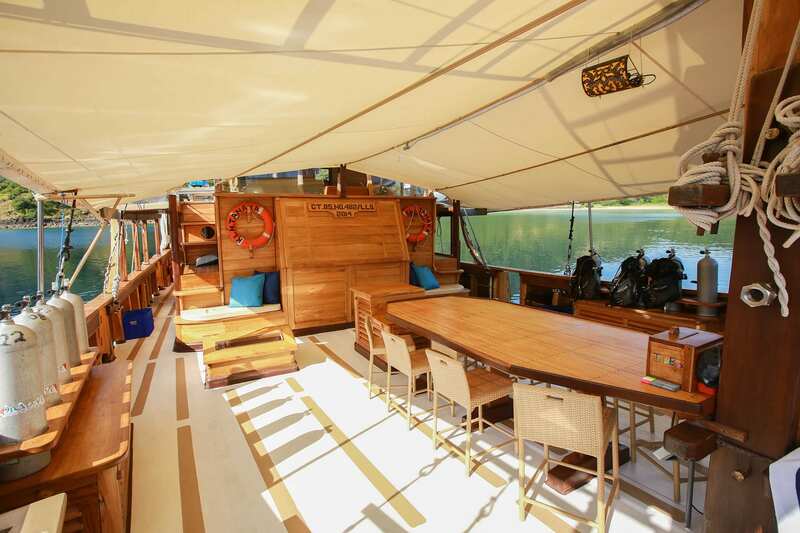 5 cabins accommodate up to 15 guests.